Release Enviro-BioticsTM to inhibit growth of contaminants like mould, bacteria & allergens. Instead of just simply purifying the surrounding air in your home, BetterAir also releases Enviro-BioticsTM – environmental probiotics – that can reach and clean anywhere in your home/office, including inside your mattress, under your carpet and on every door handle and shared object. These natural probiotics restore the balance of a contaminated space by introducing healthy bacteria into the environment. The nourished microflora consequently helps boost your natural ability to protect against irritants and reduces triggers to your immune system by indoor contaminants. Additionally, BetterAir will also eliminate bad odours generated by germs. This technology is chemical free and provides Ecological Balancing for all. It is especially beneficial for individuals with asthma and other allergies. Biotica800 releases a mist of Enviro-BioticsTM and automatically cleans an area of up to 80 square meters. Its cartridge lasts 3 months. Living and working in an environment protected by Enviro-BioticsTM enhances your well-being by cleaning the air, surfaces and objects – especially in hard-to-reach areas. The Enviro-BioticsTM travel spray is the perfect everyday carry for protecting your personal space. Pollutants thrive in enclosed areas and are most common in public spaces such as airplanes, trains and cars. Spritz 2-3 squeezes on your surroundings to create a layer of good bacteria that protect you from residual pathogens and eliminate odours. What makes BetterAir's products different from other products? BetterAir is the innovator of the world’s first and only probiotic air, surface and object purification systems. Pioneering a way to apply probiotics into the environment and using their natural intelligence to bring balance to indoor living and work places. Conventional purification and cleaning methods indiscriminately kill all bacteria- harmful and beneficial alike, causing an imbalanced, sterile environment in which pathogens have the capacity to mutate into resilient superbugs and dominate the environment. Alternatively, BetterAir’s Environmental Probiotics compete for and deplete the food resources that allergens, pathogens and mold require in order to multiply and propagate, reducing their presence and help in the elimination and prevention of noxious odors due to microbial contamination. Probiotics are naturally occurring organisms found in nature and within your body and are defined as beneficial bacteria that within your body contribute to a person’s overall well being by controlling up to 80% of our immune system. A diverse microflora of bacteria within ones intestinal system is critical to a healthy immune system. They are commonly found in foods such as yogurts, fermented vegetables and are consumed daily as dietary supplements. 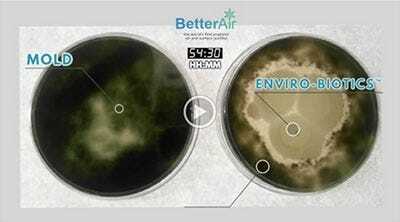 How do BetterAir Environmental Probiotics work? 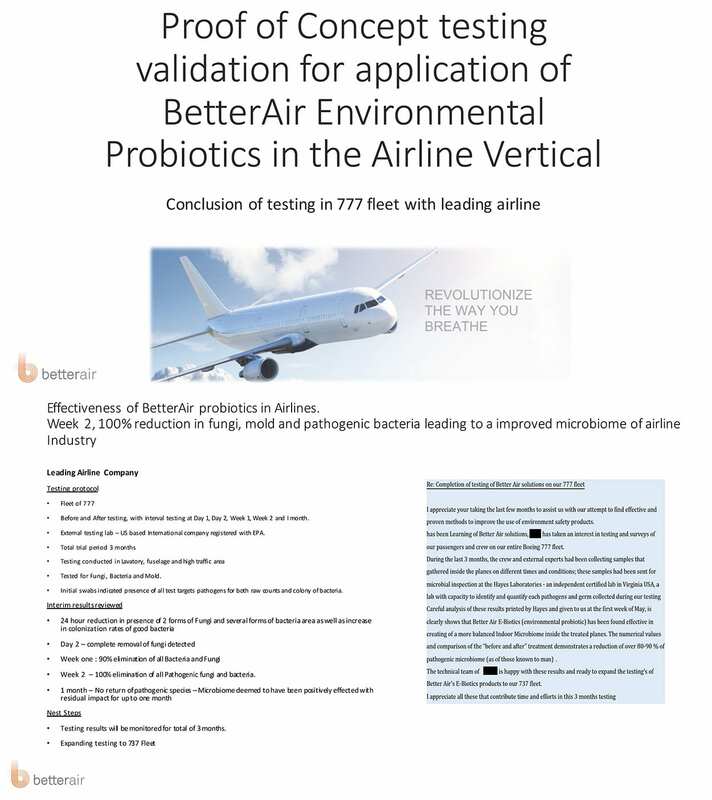 BetterAir’s patented technology repetitively releases microscopic sized Environmental Probiotics known as Bacillus ferment. Billions of micron-sized probiotics form a protective layer of microflora which coat and shield surfaces and objects, resulting in a healthy microbiome. BetterAir’s Environmental Probiotics also deplete the resources that allergens, pathogens and mold thrive on creating an environment that is abundant in good bacteria and minimizes the pathogens resulting in an environment where your immune system is not over-whelmed by contact with pathogenic organisms. Are BetterAir products safe for humans, pets and animals? Due to their naturally occurring biological nature, all BetterAir products are safe for human, pet and animal contact. They are also environmentally friendly, 100% natural and organic and biodegradable. What are the optimal storage conditions for the BetterAir products? Probiotics should be stored at room temperature and direct sunlight is to be avoided. If I have an existing UV light purification system what effect will that have on the probiotics? A UV light purification system may destroy some of the probiotics that get drawn into the UV light as it kills everything…. good bacteria and bad. Most probiotics will land on indoor surfaces and won’t be affected by the UV light purifier. In order to get the most out of your BetterAir purifier, DO NOT position it near the UV light purification system. How often does the BIOTICA cycle and for how long each time? The BIOTICA will disburse a "dose" of Enviro-Biotics approximately every 30 minutes for approximately 30 seconds. This cycle changes with the utilization of the 10-hour pause mode. How long does the probiotic cartridge last? Under normal operating circumstances the cartridge will last 3 months or 90 days. The cartridge can empty more quickly with the continued use of the manual dispersion (snowflake) button. How do I know when to change the probiotic cartridge? You should change the Enviro-Biotic cartridge every three months or when it is empty. Our initial units do not have an indicator light to show when the cartridge is low or empty so you must check the unit’s cartridge regularly. Our more recent units have a red light indicator on the unit will light solidly when the cartridge has approximately two weeks of supply remaining and blink red when the cartridge is empty and needs replacing. Please check the instructions that came with your unit to ascertain the presence of this feature. How do I change the Probiotic cartridge? Please refer to quick guide, user manual located here. What is the warranty on the BIOTICA and how do I make a warranty claim? Your BIOTICA800 is warrantied to be free from defects in manufacturing for a period of one year. To be eligible for a return/refund or an exchange, you must contact us to receive a Return Merchandise Authorization (RMA) form. To obtain an RMA form please call our Customer Care team at 1-833-BIOTICA – 1-833-246-8422 to speak with a representative, visit our website @ www.betterAirUS.com to chat with us, or you can email us directly at BAE.Support@customercareteams.com, which will start the process of returning your Biotica800 device directly to Better Air Environments, LLC and to receive a full refund or to exchange your unit. Please ensure that your item is in the same condition as you received it in. Please be sure to send it back in the original packaging with all the accessory parts properly packed. If the seal is broken on the probiotic cartridge, you do not need to return it. If the original packaging is no longer available, please pack it in an appropriately sized box with protective bubble wrap to protect the device from any damage that may occur during the return shipment process. You will be responsible for paying return shipping costs. Return shipping costs are non-refundable. What is the life expectancy of the BIOTICA? With proper care the BIOTICA800 will last for many years of use. Where do the probiotics come from? The proprietary strains of probiotics that comprise our Enviro-Biotics are naturally occurring and are sourced from the soil and from plants and then cultured in a laboratory to insure they are of the highest purity and safety. How long does it take to feel the effects of the environmental reset? Depending on the severity of the pathogenic infestation of the indoor environment individuals begin to experience the positive effects of a rebalanced indoor environment in in approximately two to four weeks. Where should I place my BIOTICA for best effect? We recommend placing the BIOTICA800 in your bedroom as that is where most people spend most of their time when home and that is also where dust mite allergens tend to be the most common. Do not place it near an open window as the incoming air can be filled with pathogens (pollen for example) negating the "safe zone" you are creating in the bedroom. Conversely, if you are battling odors or a pet dander allergy for example you should place the unit near the area the odor is emanating from or where the pets are located. When I first place the cartridge into my BIOTICA and plug it in bubbles come out of the top of the unit. This is normal because some of the probiotics create fermentation in the water and due to that bubbles release, it may happen in the first few minutes of usage. Just wipe the bubbles away. They will subside shortly. How long is the BIOTICA warranty? Our 1-year Limited warranty begins from the date of the original purchase and covers any defective product. If repair is not practical, BetterAir Environments, LLC will replace the defective product with a fully warranted, factory-reconditioned product that is the same or has similar functionality with the exceptions stated below. Does not cover damage caused by misuse or when used other than as intended and described in the product instruction manual. The warranty does not cover loss or damage to removable parts. This warranty gives you specific legal rights, and you may have other legal rights that vary from state to state. Please register your BIOTICA800 at www.betterAirUS.com. What does the red light on the power block mean? When illuminated it shows that the voltage conversion from AC to DC is operating and the wall receptacle is active. What are BetterAir’s Enviro-Biotics and where do they come from? BetterAir’ s Enviro-Biotics are a proprietary blend of multiple strains of naturally occurring probiotics (found in the soil and on plants) that are cultured (grown in a nutrient substance) under laboratory conditions and then suspended in water. They convert to the spore (hibernation) form when denied air and nutrients. Once diffused into the air they come to rest upon surfaces and penetrate objects where they germinate into living organisms (air and nutrients are available) and begin to consume all the food sources required by the pathogenic bacteria in order to multiply and propagate. Why is the BIOTICA800 more than just another air cleaner? Conventional air cleaners either filter contaminants from the air that passes through them (the amount of air they can handle is a limiting factor on their effectiveness) or apply a scorched earth kill technology such as UV lights, Photo Electrochemical Oxidation (PECO) or ozone generation to kill all bacteria that are exposed to it indiscriminately both bad and good. The biggest limiting factor of these systems is that they treat the air alone. However, in order to have clean air you need to have clean surfaces and objects. All a containment that is present on a surface or within an object needs to pollute the air is to become airborne thru the wave of a hand across a table or the fall of a foot upon a carpet…..bacteria and germs are microscopic in size so any air movement can launch them into the airways making them available for human inhalation. This is where the BIOTICA800 is different. We purify the air, surfaces and objects within an indoor environment by restricting the growth of bad bacteria and replace it with BetterAir’s Enviro-Biotics that reset and repopulate the indoor environment to mimic the outdoors where contaminants are naturally limited. Why are most conventional cleaning methods detrimental to humans and the indoor environment? Most conventional cleaning methods, especially antimicrobial and antibacterial cleaners kill 99% of the bacteria or microbes on a surface, but since there are trillions of them there are still many survivors. The survivors tend to be the resistant or super bugs that then are able to take over this environmental wasteland created by the scorched earth cleaning agent where they grow and multiply into concentrations that can overwhelm our immune systems when transmitted to our bodies. Rule of thumb is that bacteria counts double every twenty minutes so a single resistant bacteria left after cleaning can multiply into two trillion in twenty-four hours. This is where BetterAir is different……..BetterAir’s Enviro-Biotics repopulate the environment with beneficial bacteria consuming the food sources that all bacteria require resetting the indoor ecology to be healthier for our bodies. BetterAir offers solutions for resetting and rebalancing any size indoor environmental space by harnessing the power of Enviro-Biotics™. BetterAir offers all-natural, organic, chemical free solutions, to create healthier indoor living and work spaces. Enviro-Biotics™ are the safest, most natural way to achieve a superior indoor air environment mimicking the natural ecological balance found outdoors. A working adult touches as many as 30 contaminated objects a day in the workspace. These objects may be contaminated with disease causing bacteria. You may think your toilet is more contaminated than a keyboard and mouse, but think again. Protect your office space with BetterAir probiotics by penetrating the hard to reach areas you work with every day. 57% of travelers changed their hotel room because it was too dirty. 75% of traveler’s first concern is their room’s bedspread. Travelers come and go, but bacteria remain after thousands of hands transfer and relocate germs. BetterAir provides your guest a cleaner, healthier and safer environment. 78% of students report that cleanliness has an impact on their health. Cleanliness ranked as the fourth most important building element to impact the students’ personal learning. BetterAir reduces the amount of mold spores and allergens within the learning space resulting in better indoor air quality and a healthier and cleaner environment for students and faculty members. A healthy school is a successful school! Sick Building Syndrome, which affects about 30% of new and remodeled building, is also known to have an effect in the marine industry, commonly known as Sick Yacht Syndrome. A dark, damp atmosphere with wide temperature variances can contribute to poor air quality in your boat. BetterAir Enviro-Biotics™ can help reduce foul, musty, mildewy odor and improve air quality, by nourishing your yacht space with billions of beneficial probiotics and reduce the onset of Sick Yacht Syndrome. 1.7 Million Health Facility Acquired Infections occur in the U.S. each year, resulting in 99,000 deaths and an estimated $20 billion in unnecessary healthcare costs. Did you know that probiotics are the most effective solution in breaking down biofilm harboring antibiotic-resistant organisms? Conventional cleaning and purification methods inadequately clean and disinfect medical facilities which is one of the leading causes of Health Facility Acquired Infections. How Can People Avoid Sharing Pathogens During Their Gym Visits? Impossible (unless all body parts are covered and shielded). Members are breathing the same air and sharing equipment – treadmills, weights, yoga mats and locker rooms. Carpets, towels and sportswear are the most favorable home for dust mites, pet dander, allergens and harmful bacteria to grow and emit bad odor. Please call us at 1-833-246-8422 (833-BIOTICA), press option 2, then after the prerecording message, press option 1; or email us at BAE.Inquiries@CustomerCareTeams.com to receive more information on BetterAir’s custom crafted commercial solutions.